IS YOUR BIRTHING HOSPITAL BABY FRIENDLY? Guides are being developed for legislation in 28 states, DC, Guam, and Puerto Rico. They will be published in the Online Guide: What You Need to Know About the “Break Time for Nursing Mothers” Law section “What if your state already has a law?” Each state has a webpage featuring a web version and downloadable PDF of the Guide to the Rights of Breastfeeding Employees, which provides an overview of laws that impact breastfeeding employees in each state. See the Guide to the Rights of Breastfeeding Employees in Delaware and Talking to Your Boss About Your Pump - Delaware. ​The U.S. Department of Labor compiled compliance assistance materials on the Break Time for Nursing Mothers provision of the Fair Labor Standards Act. Please take special note of the Community Outreach and Resource Planning Specialists (CORPS) Contact List. The CORPS work to organize compliance assistance and outreach, provide planning and enforcement support, and more. 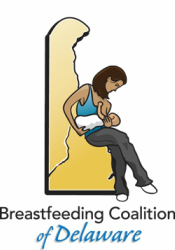 They are a wonderful resources for breastfeeding employees and their employers, as well as all of us who are working to support the field! This guide provides federal workplace support resources in an easy to understand format to ensure all moms have the information they need to make working and breastfeeding a success. It was designed to help employees understand their rights as a breastfeeding mom in the workplace and serve as a break time resource for families and employers with questions about the law.